This entry was posted in cupcakes, Desserts and tagged carrot, cream cheese, cupcakes, orange by Janet. Bookmark the permalink. The frosting was good. So was the cupcake. They’ll be gone by 7 pm. Now that is a carrot cake (or cupcake if you want to get technical). Those cupcakes look great. I think orange would go well in the icing. Thanks for the recipe. Orange cream cheese frosting! Wow! Love it! Janet, these look and sounds delicious. I love carrot cake but usually have to avoid it due to a tree nut allergy. Definitely going to make this recipe! You are sooo right, I want one right now! Actually your recipe is very reminicent of one an Australian friend gave to me years ago..Unfortunately it was lot in moving so I am thrilled to have found you! I enjoyed reading your posting…I’ll be back often! Like the first comment – I like GOOD carrot cake. However, cinnamon is a no-no for me, so I tend to make/bake/order/eat something else… We have very similar recipes…I love the pineapple and raisins in the carrot cake and the orange zest in the frosting is a stroke of genius!! Buzzed! Yes I admit it I want one, or two, or maybe three! This sounds like a winning combination Janet! I so want to try the orange cream cheese buttercream. Once a month I make a big batch of cupcakes for donation and there are very few recipes that make nearly 3 dz cupcakes. Your recipe here is definitely a time saver! Love the flavor combination here and they look amazing. Thanks for sharing. With carrot cake I can take it or leave it, but a good piece of carrot cake is a little piece of heaven! Your recipe sounds a little like the one I use and it is delicious! WHOA! Fat lady in front of her computer, drooling. Kind of sounds like a Dave Mathews song … … no, no, no that was under the table and dreaming … either way, the cupcakes and the frosting look dreamy and drool-worthy! Oh I am SO the opposite! I absolutely adore carrots so this is just right up my alley! Looks fantastic! I actually really love carrot cake! It was one of the first things I ever learned to bake – the orange cream cheese buttercream sounds AMAZING! Orange you glad you made these? Lame I know but I couldn’t resist, Congratulations on another well deserved Top 9! *GROAN* Lol. Leave it to you to make that joke, Sandra. And thank you! Looks great, I agree the frosting is the best part! These cupcakes look fantastic! Love the addition of the carrots 🙂 They’re almost too pretty to eat! Awww; thanks Kelly!! I’m glad you’re following now. I loooove carrot cake! I’ve really been craving it lately, too. I want to stick my face in those mounds of frosting! Oh, how I love carrot cake. These look very nice. If I didn’t kill everything I tried to bake, I might give these a try. Haha. I’ll stick grilling and frying. But if you want to bake up a batch of these and bring them to me, I would not try to stop you! I have my moments with carrot cake. This looks like a good recipe based on the spices and the zestiness of the cream. Thanks! The carrot cake picture is too good! I love carrot cake…the recipe is very good, but yes, as you suggested, I’d add a bit more sugar. Drooling! Yummm! I never make carrot cake because I always have this giant cake left over and… I usually eat it. 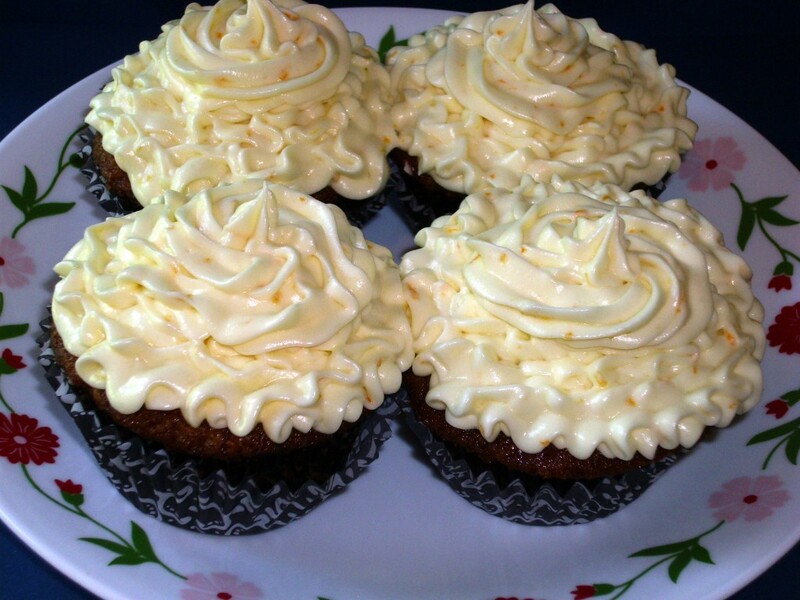 Carrot cupcakes are a brilliant answer! These look wonderful. Love the orange cream cheese frosting. You piped them beautifully! It really is hard to believe that carrot cake can taste so good! I love what that sign said!